Difference between lyophilic and lyophobic. 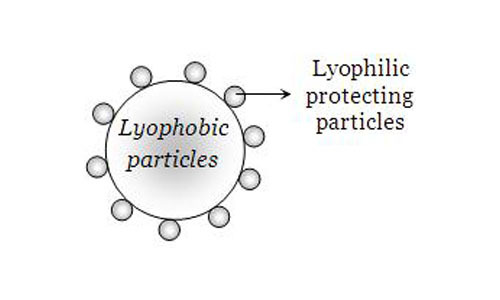 • Categorized under Chemistry,Science | Difference between lyophilic and lyophobic. Lyophilic and lyophobic are terms used to describe solvents and how they react to water when mixed. The term “Lyo” means “solvent” and “Philic” means “to attract”. Lyophobic can be broken into two terms as well – “Lyo” and “Phobia” where “phobic” means “to hate”. Thereby, lyophilic substances are those that attract the solvent and readily mix with it to form a uniform mixture while Lyophobic means a solvent which is not missible with water and will tend to separate out. Lyophilic solvents mean liquid loving colloids or solvents which mix completely in water whereas lyophobic solvents mean liquid-hating solvents which hate water and hence do not easily dissolve in it. The reason some solvents are lyophilic and other lyophobic is owing to the charges present on the molecules that lead either to attraction or repulsion with the molecules of water/solvent. When there is attraction between the molecules, they easily mix and form a uniform solution while in cases of repulsion, the two substances separate out at separate entities. A Lyophilic solution is very easy to prepare as the solute easily dissolves in water and does not need any additional stabilizer. Lyophobic solvents are comparatively difficult to prepare as these solvents hate water; thus, different techniques need to be applied to create a thorough blend. They also need additional stabilizers so that the lyophobic solvent remains in that state. Lyophilic solvents are naturally stable as there are strong attractive forces amongst the molecules which keep them bound firmly with water. Lyophobic solvents are comparatively less stable as there is less force of attraction between the molecules. It is said that the intermolecular forces of attraction are very weak in lyophobic solvents necessitating additional agents like stabilizers to maintain them in the dissolved state in water. The charge on the solvents which are lyophilic will depend on the pH of the solution and hence can be positive, negative or neutral whereas the charge on the lyophobic solvent can be positive or negative. Lyophilic solvents are reversible in nature as on evaporation of the water there will be formation of a residue which can again transforms itself in the colloidal state on addition of water. In contrast, it is an irreversible reaction in case of Lypohobic solvents, as once the water is evaporated; the residue left behind cannot be converted into a solution again by adding water. Depending upon the charge, lyophilic molecules may migrate to the cathode, anode or not move at all. In case of Lyophobic solvents, the molecules when exposed to electrophoresis, will only move either to cathode or anode. Lyophilic solvents are not easily precipitated or coagulated as they are very stable in their state. Lyophobic solvents are easily precipitated or coagulated on addition of some suitable electrolytes. Lyophobic solvents are not very stable and hence can be easily broken down. Lyophilic solvents are usually formed by organic substances like starch, gum, proteins etc. The Lyophobic solvents are usually formed by inorganic materials like metals, their sulphides etc. The particles of Lyophilic solvents are easily dissolved and not visible whereas the particles of the Lyophobic solvents are not visible easily but can be detected using microscope. Lyophilic solvents are hydrated and have very high levels of water whereas the Lyophobic solvents are not easily hydrated. Lyophilic are water loving solvents whereas Lyophobic solvents are solvents which hate water and are not easily miscible with water. Lyophilic solvents mix easily with water without any treatment whereas lyophobic solvents need special chemicals called stabilizers to make them miscible with water. rachita. "Difference between lyophilic and lyophobic.." DifferenceBetween.net. November 17, 2014 < http://www.differencebetween.net/science/difference-between-lyophilic-and-lyophobic/ >. Thanks, it helped a lot.